Watching the ambient drift of Feria Musica’s Sinué is like watching the waves roll in on the shore, or the clouds play across the sky. The perfomers – and their environment – slip from one state to another in a flow of storms and serenities, drawing us on an emotionally resonant joyride. 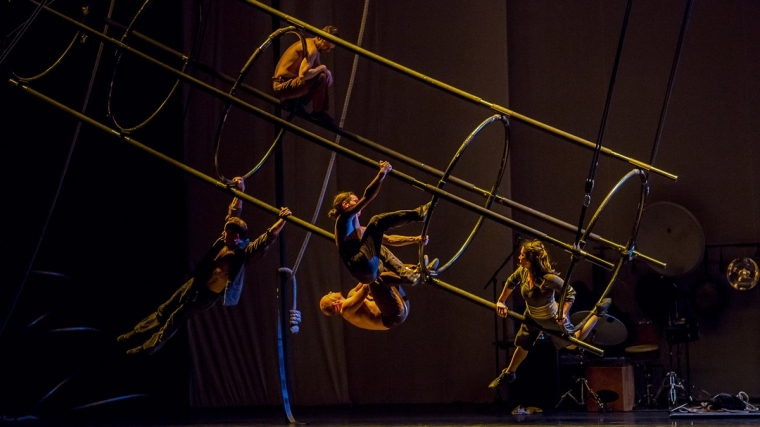 Appearing in the UK for the first time as part of Brighton Festival, Sinué’s seven small figures light up the huge stage of Brighton Dome in their playful exploration of the snaking set. The cylindrical focal tower, which houses silhouetted performers as the opening lights flicker across the stage, is a gateway into the worlds of imagination that we all create for ourselves. To Artistic Director Philippe De Coen, acrobatics are a language of their own, to express emotions or ideas, and Sinué reveals a successful example of this approach. Inspired by the illustrations of a children’s picture book, five circus artists embody the spirit of creative exploration, flitting and throwing themselves around the giant climbing frame; this is the freedom we imagine we had as fearless youths – but we were never this skilled in playing out our fantasy adventures. Circus technique is woven so finely through the bodies of Mathieu Antajan, Natalia Fandiño, Loïc Faure, Julien Fournier, and Pedro Sartori do Vale, that it’s easy to forget the levels of risk and skill underlying their uninhibited displays of playful abandon; tricks emerge from games, rather than appearing for their own sake, and the choreography gives a loose and improvised impression – although the precarious balances, near collisions, elegantly casual tumbles and climbs must be anything but. The falls have real weight in them – this is not a dreamworld, but one of immediacy and invention. In parallel universes are the two musicians – Marc Anthony and Olivier Hestin – who tinker with homemade devices that are wound, beaten, or strummed, to create an atmospheric soundscape that breathes in and out with the performers. As ropes unravel and towers fall, I wonder if the discordant gongs prompt the changes or mark them. Sinué is a massage for the senses. Projected grids and lines, jungle branches and Rorschach blot soundwaves dart across the back wall of the theatre, meshing with shadows of the onstage figures. This is not a show to thoughtfully grab hold of and dissect, but to absorb and feel. I leave the theatre as if I have just emerged from a flotation chamber. Moments that stick are the absurdity of Faure’s facial contact juggling as he rolls round the floor, and the intensity of his later 3-ball patterns to frenetic beats and hurdy-gurdy music (not forgetting, of course, the comedy of his pink pants and their part in his frantic juggling); Fournier is beautifully ridiculous as he mimics Faure’s physicality, and his jelly legs are superb – as much a surprise when they hold him up as when they fold unexpectedly to the floor; I always find Fandiño fascinating to watch in a paradox of fragility and strength. As she twists and weaves herself around a simple chair, seemingly unable to find a peace, she becomes an ultimate symbol of femininity. The only woman onstage in this innocent realm is never reduced to an object of sexuality. Familiar objects and equipment are rediscovered through a curiosity I associate with children or young animals. As abruptly as a breakfast cereal box can become a castle, a remote control, or tomorrow’s trash, the players shift their games and mood. I’m rarely inclined to see a show more than once, but this I could watch again and again, sure that I will experience Feria Musica’s imaginative multitudes differently each time. Tagged as acrobatics, aerial, Arts, brighton dome, brighton festival, Bruno Renson, Circus, Contemporary circus, critique, culture, Dance, feria musica, juggling, Julien Fournier, Loïc Faure, Marc Anthony, Mathieu Antajan, Natalia Fandiño, Olivier Hestin, Pedro Sartori do Vale, Performing Arts, Philippe Baste, philippe de coen, physical theatre, review, sinué, Theatre.